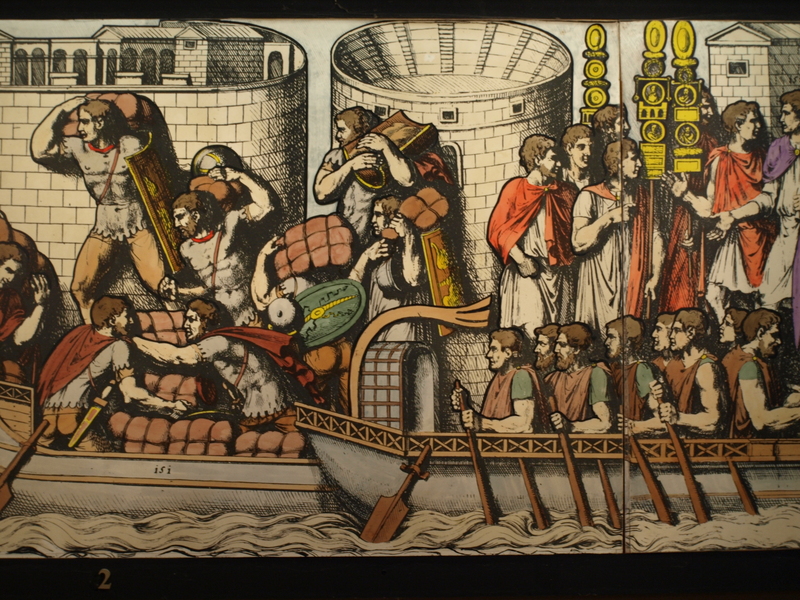 ROMAN SOLDIERS LOAD THEIR EQUIPMENT INTO BOATS, READY TO CROSS THE RIVER DANUBE AND ATTACK DACIA. BEHIND THEM WE CAN SEE A WALLED TOWN AND AN AMPHITHEATRE WHERE GLADIATORS WOULD FIGHT. The presence of the amphitheatre indicates that the embarkation is taking place at a major town on the south bank of the Danube, probably Viminacium or Singidunum, both in the province of Moesia. Trajan’s main strategic objective in this war was Sarmizigethusa, the Dacian capital, situated on the NW slopes of the Montes Sorrorum (the present-day Transylvanian Alps). Either of these Roman towns would have been good locations to assemble the army and cross the river. We see a group of auxiliary soldiers loading their packs and shields. These men are identified as auxilia the fact that they wear the “lorica hamata”, ring-mail shirts (and very skimpy ones too!) There is a widespread notion among modern re-enactors that the Roman auxilia carried oval shields – and in general the Frieze supports that view. Yet here we see the dangers of being too dogmatic on these questions. The auxiliaries here clearly use a mixture of the oval “clipeus” and the oblong Legionary “scutum”. Note also the three splendid Praetorian standards behind a group of Trajan’s generals (always dressed in orange-red on our Frieze.